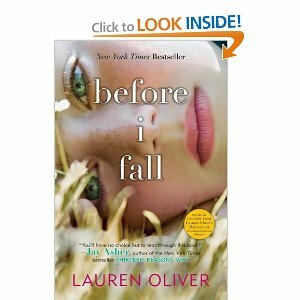 The first time I laid eyes on before i fall by Lauren Oliver was at NCTE last November. I was given a spiffy swag postcard for a free digital download. The cover is captivating, memorable, and had me intrigued. When I got around to downloading the book (I wasn’t in a huge hurry; my jury is still out on digital books), the offer had expired. Imagine my delight when I was returning some books to my public library, when I looked behind the librarian and spotted an advance review copy of the book that someone had deposited in the night drop several weeks before. My delight over spotting only grew more as the librarian agreed to let me take it home to read. Imagine having to live the day you die over. Again. And again. At the moment Sam realizes she is dying, she awakens to start the day all over. Each “death/awakening” leads her to make different choices. She ranges from rash-trying to seduce her high school teacher, to touching-spending the whole day with her younger sister. This page-turner will lead readers to think about how the choices that are made affect others and how even small actions, can influence others. That’s a message that middle school and high school readers can’t hear enough in my opinion. Samantha is brutally honest about how she came about being one of the most popular girls in her high school. The things she and her friends have done over the years to secure their spot in the high school food chain is not pretty. Despite my first opinion of Sam-a pretty unlikable character, I found myself rooting for her and wanting the outcome to be different. I found it to be quite the tear-jerker as I raced through the book. I keep looking at the cover to see if there are images in those eyes if you look close enough? A great read. I look forward to reading her next book when it comes out in February 2011. The author was delightful while she signed autographs at ALA this past weekend.